Whether you are married, dating, or in a relationship, a romantic dinner is always a nice way to spend your evening. 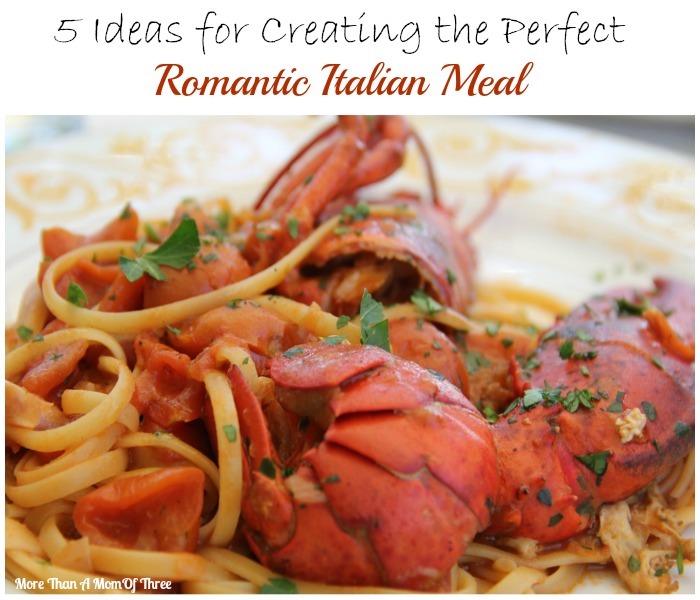 Not only is Italian food filling, delicious, and easy to make at home, but it makes for a romantic meal. If you want to create a perfectly romantic Italian dining experience for two, the possibilities are endless. With a creative appetizer, a classic pasta dish, a decadent dessert and an inventive drink, you can create an impressive meal with minimal fuss. Here are a few ideas to help you create the perfect romantic Italian meal on your next date night. Spaghetti alla Carbonara is a decadent Italian pasta dish made with eggs, cheese and bacon. This lightened-up version of Spaghetti Carbonara with Peas for Two is every bit as delicious as the classic version—but it won’t leave you feeling overly stuffed and lethargic after eating it. Best of all, this dish can be made in as little as 30 minutes from start to finish. Tiramisu is a classic Italian dessert that features ladyfinger cookies soaked in coffee, layered with sweet creamed cheese, and dusted generously with cocoa. This recipe is a quick and easy variation on the classic cake. In this version, the tiramisu is served in individual parfait glasses, making for a beautiful presentation. For a truly relaxing evening, top your meal off with an Italian cocktail. This Sgroppino recipe features Prosecco, the classic Italian sparkling white wine. Mixed with chilled vodka and lemon sorbet, this delectable drink is sure to be a winner. The perfect meal isn’t complete without the perfect ambience. For your Italian feast, be sure to set the mood appropriately. Dim the lights and dine by candlelight. Make a playlist filled with love songs by Luciano Pavarotti, Andrea Bocelli and Frank Sinatra. Uncork a straw-covered bottle of Chianti. Adorn the table with a red and white checkered tablecloth. Place fresh flowers or breadsticks in a homemade vase made from recycled San Marzano tomato cans. 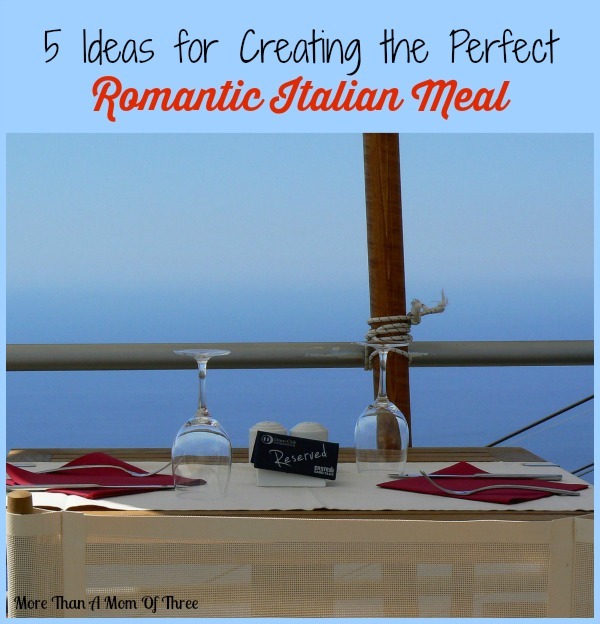 With these romantic Italian meal ideas, you can soon construct an idealistic dinner for you and your date. Whether you’ve got a toddler joining you at the table in a high-chair, or you are trying to impress on a first date, you can’t go wrong with delectable Italian treats. The information for this article was provided by the professionals at Ynot Pizza, an Italian restaurant in Virginia Beach. Do you have a favorite romantic Italian meal? Wow–what a great menu to celebrate a special occasion. My honey’s birthday is coming up and he’d love everything above–thanks for the inspiration! Kathleen Kennedy-Leon recently posted…MyBestofBothWorlds wrote a new post, Imagine Spring at OshKosh BGosh! Happy Birthday to him – my husbands is in a couple of weeks I have to start planning soon! Wow – with these tips you can totally make it feel like a romantic restaurant at home! I can’t wait to try them out! That looks and sounds like such a great meal! This is such a fabulous meal! What a lucky guy… my hubby is lucky to get a steak for his bday! Chelley @ AisForAdelaide recently posted…*EASY* Winter Bumper Repair! Now you’ve got me good and hungry. I love prosciutto and cantaloupe – one of my all time favorites. 😉 that is one of my favorites too! Each of those suggestions had my mouth watering. They all sound like they need to be on my table soon! Great tips!! Some of my favorite meals are our date nights at home!! those are great tips!!! we love italian in my house.